We only use the best components and materials in our Reyland brake kits. We use genuine Reyland and AP Racing rotors which have been heat-treated to ensure the best possible resistance to warping. We also only use genuine AP Racing disc-to-bell fixings as they won't rust and they're stable under extreme heat ranges. Unlike some kits, our rear brake kits won't leave a large rusty area which isn't used by the brake pads. 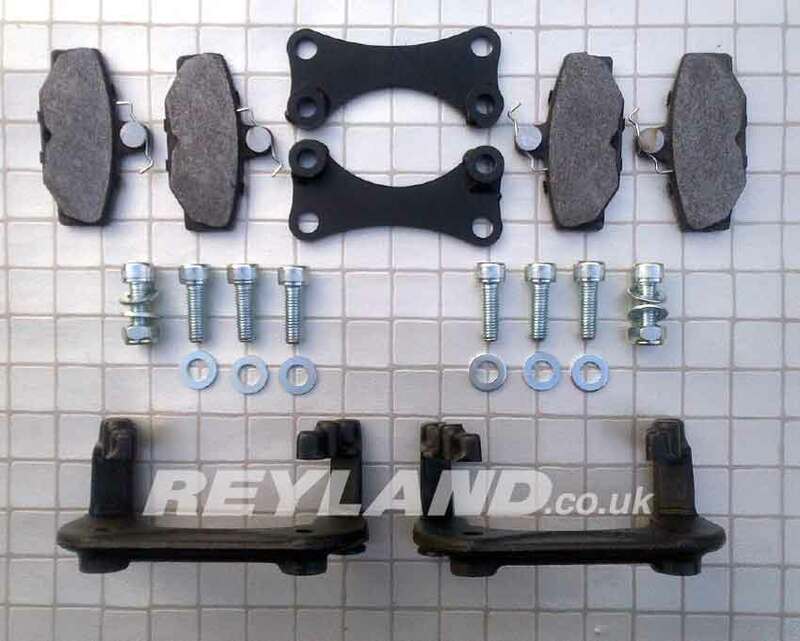 The Reyland Sport rear brake conversion features high performance 300x22mm two-piece discs and Reyland brackets which utilise a Cosworth 4x4 rear brake caliper. The kits are supplied with discs, bells, AP Racing disc to bell fixing bolts, brackets, braided brake hoses and unions, but do not include calipers or pads. When used in conjunction with Cosworth 4x4 rear calipers, this kit is suitable for all Sierra/Sapphire Cosworth 2WD, RS500, XR4i and XR4x4 models. Bell colour options: black, silver, gold. Disc surface options: plain, straight grooves, curved grooves, J hook grooves. The Reyland Sport rear brake conversion features high performance 325mm two-piece discs and Reyland brackets which utilise a Cosworth 4x4 rear brake caliper. The kits are supplied with discs, alloy bells, AP Racing disc to bell fixing bolts, billet cnc machined brackets, braided brake hoses and unions, but do not include calipers or pads. Ideal for cars equiped with 18" wheels. The Reyland Sport 325 rear brake conversion features alloy bodied calipers, two-piece 325x20mm vented rotors, Reyland billet alloy cnc machined mounting brackets and bells. The kit is supplied with all required parts including discs, pads, AP racing disc to bell bolts, brackets, braided brake hoses and unions. This kit is fully MOT compliant as the calipers have cable operated handbrake mechanism built in that simply hooks up to your existing handbrake cables. The Reyland Track 330 rear brake conversion features 4-piston AP Racing CP5200 calipers, two-piece 330x28mm precision ground discs and Reyland billet alloy mounting brackets and bells. The kits are supplied with all required parts including discs, pads, bells, bolts, brackets, braided brake hoses and unions. This kit does not provide a mechanical parking brake facility, as required for MoT tests. We can provide an optional hand brake conversion kit which includes custom made brackets, a specially machined (exchange) pair of original Cosworth 4x4 rear brake caliper carriers and a set of slim-line brake pads. Can also be used in conjunction with a hydraulic handbrake. Caliper colour options: red, black. Disc surface options: plain, straight grooves, curved grooves. Other pad makes and compounds available at extra cost. The Reyland Track rear brake conversion features 4-piston AP Racing calipers, two-piece AP Racing discs and Reyland mounting brackets. The kits are supplied with all required parts including discs, pads, bells, bolts, brackets, braided brake hoses and unions. This kit does not provide a mechanical parking brake facility, as required for MoT tests. We can provide an optional hand brake conversion kit which includes custom made brackets, machining of your original Cosworth 4x4 rear brake calipers and a set of slim-line brake pads. The Reyland Track 350 rear brake conversion features 4-piston AP Racing CP5200 calipers, two-piece 343x28mm precision ground discs and Reyland billet alloy mounting brackets and bells. The kits are supplied with all required parts including discs, pads, bells, bolts, brackets, braided brake hoses and unions. This kit does not provide a mechanical parking brake facility, but can be used in conjunction with a hydraulic handbrake conversion. 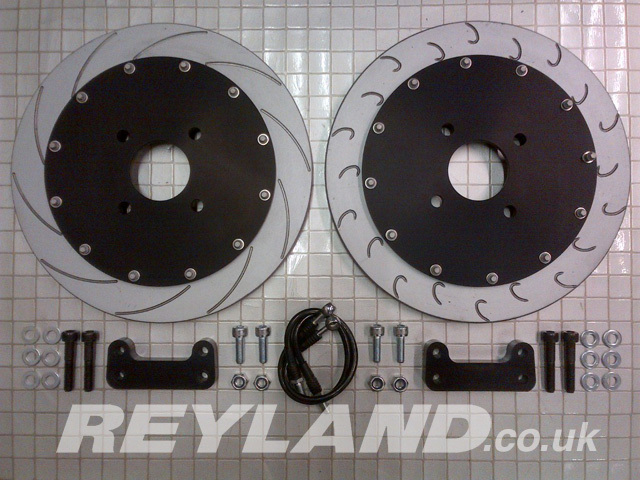 This kit is perfect for anyone running a Reyland 330mm 4-pot rear brake conversion who wants to stay MoT-compliant by having a mechanical parking brake facility. The kit uses the original rear caliper for handbrake purposes.